Brace yourselves and prepare for a new sound in extreme music. Unlike bands like Finntroll and Windir, which use folk music to bolster their approach to black metal, Korpiklaani takes a separate path, using facets of power metal to add a fresh twist to folk music. 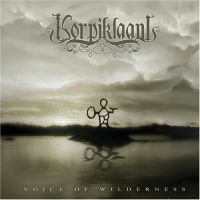 Originally known as Shaman, Korpiklaani releases its sophomore effort, Voice Of Wilderness, which may leave many metal heads scratching their scalps. The 11 tracks on this CD definitely focus on folk music. The heart of the band’s sound consists of Hittavainen on violin, jouhilkko (a lyre), and flutes; Ali on percussion; and Juho on accordion. On the electronic side are mastermind Jonne (vocals and guitars), Matson (drums), Honka and Cane (guitars), and Arto (bass). The electronic music is mostly power metal, with the guitar riffs catchy and groovy. The band is effective at combining these sounds, particularly on tracks such as Pine Woods (my personal favourite), Spirit Of The Forest, and Hunting Song. Lyrically, the band touches upon two subjects: beer and nature. Lyrics are sung in English, with only Kädet siipinä sung in Finnish. The song’s title means ‘hands as their wings’. The compositions are simple and straightforward. Don’t expect complex metaphors and esoteric lore here – this band loves to have a good time, and the lyrics capture this perfectly. Fans of extreme metal may not find much to ‘bang’ to on Voice Of Wilderness. But if you like the hummpa sound found in bands like Finntroll, Skyclad, and older Moonsorrow and would like to hear the folk-music elements out front, then this CD is for you.